Restricted to 15 item(s) only. These beautiful ring cushions feature a satin cushion decorated with gathered sheer organza and finished with a brilliant diamante rose. Also features a lovely little rose patterned lace garland with a 3mm Bow / ribbon to tie your beautful wedding rings onto the pillow. Ring pillow measures approx. 17x17cm. Get it Fast - Order online & pick it up or have it delivered from our store in Sydney, Australia! 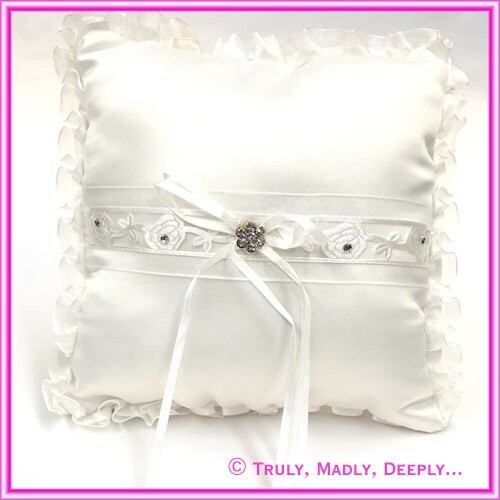 Wedding Ring Cushions / Ring Pillows on SALE NOW! Synopsis: Giant sale on our wedding ring cushions and ring pillows on now with prices starting from just $5. Order received today, I am very happy with the quality [Discounted Diamante Buckles]. Thankyou so much.